About 50% of the differences in athletic performance between two people can be explained by genetic differences between them, because they define their key features such as their muscle capabilities or their energy metabolism and its response to sport nutrition. Moreover, some of these genetic differences determine the degree of response to training or to the nutritional energy use: it is called the interaction between genome and environment, which is the main object of study of the new science of Nutrigenomics for Sport and Nutrigenetics for sport performance. In the Nutrigenomics online training course for Health and Sport, it focuses on the importance of Nutrigenomics for overall health of anyone and especially for the athlete in an available way for anyone interested. It will show how to optimize both nutrition and training and the recovery after a competition, based on individual genetic information. Moreover, it will explain how through the Nutrigenomics for sport can achieve the maximum athletic performance with a minimal risk of injury. It will analyze the genetic predisposition factors for power and endurance sports, and also the genetic factors involved in the oxygenation, metabolism, muscle anatomy and motivation will be discussed as well. You will learn to assess and select genetic tests available in the trade market and how to apply the findings to daily nutrition and training. 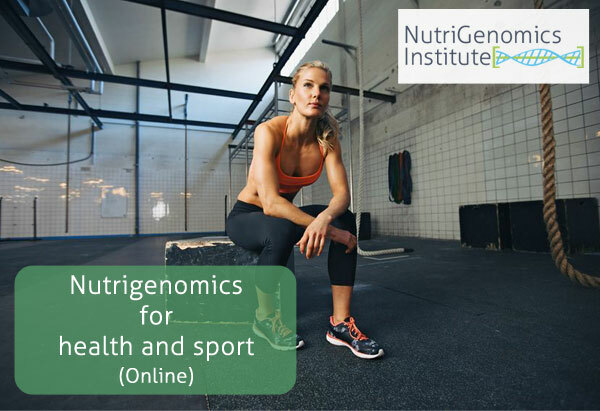 The Nutrigenomics online course in Health and Sport is particularly aimed at Nutritionists-Dietitians, athletes, professionals in sports and physical education, personal trainers, coaches of different sports, sports doctors and physiotherapists. The Nutrigenomics and Nutrigenetics online distance courses have been recorded using the latest technologies in video made by our Training Director. Our courses provide a depth training in Nutrigenomics and are more affordable than a master degree. The methodology is based on a distance education, flexible and from your home you can watch the videos of the modules with freedom of schedules. The modules also have over 400 pages of downloadable support material in pdf format. The estimated total duration of the course is 11 hours. After completing the course and after passing the self-assessment tests for each topic you will get a diploma from the Nutrigenomics Institute. This course is recommended by the Spanish Triathlon Federation for federated and school coaches. 3. Genome and Nutrition Interaction. 5. The Genomics applied to the Sports Nutrition. 6. The Genomics applied to Sports Training. This course will be available soon ! .